Cold weather can make ensuring your cat has the appropriate amount of water difficult. Even if you have diligently kept their bowls filled to the brim, frosty temperatures can cause the water to freeze over meaning your cat is unable to drink. As water underpins all of the body’s processes, from digestion to waste removal, this can have serious consequences for your cat’s health. It can be difficult to tell how much or how little water your cat has consumed. The best way to prevent issues from developing is to keep water accessible at all times. If possible, keep your cat’s water dish in warmed family areas to prevent ice from forming. 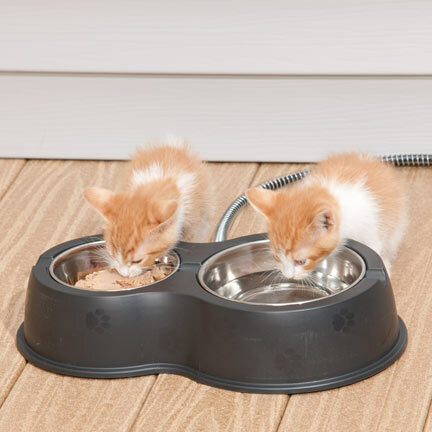 Alternatively, if your cat lives some, or all of the time, outdoors, warming devices such as the Thermo-Kitty Bowls are an efficient means of keeping water from freezing and drinkable even in the frostiest of cold snaps. Don’t forget, wet food can also turn rock solid in the wintertime, causing cats being unable to eat. This can lead to the development of serious conditions such as hepatic lipidosis (fatty liver) if not remedied quickly. In these instances, a warming bowl is a great way of making sure your cat has access to adequate nutrition year round. I live in a cold climate, our feral cats drink from our heated bird feeder and in winter we only leave dry food out.